John Walker Lindh, the American Taliban fighter who was convicted in 2002 for supporting the terrorist organization, is due to be released despite the fact he remains devoted to “global jihad.” Shocking reports of his time spent behind bars include Lindh advocating for his “right” to practice his twisted version of radical Islam and his utter hatred of America. Well, the 38-year-old is getting a nasty surprise. Don’t miss this. If you are scratching your head and wondering how in the hell is John Walker Lindh getting out of prison after serving only 18 years, you’re not alone. The former Islamic fighter, named “Detainee 001 in the war on terror,” was arrested in 2001, just months after the September 11 attacks and the start of the war in Afghanistan, along with a group of Taliban fighters who were captured by U.S. forces. Walker Lindh became radicalized after dropping out of high school and traveling to the Middle East with the support of his parents, ending up in Yemen to learn Arabic. He then traveled to Pakistan and Afghanistan and finally met his idol Osama bin Laden, who apparently thanked him for his good work, according to testimony he gave FBI investigators. “He remained [fighting with the Taliban] despite having learned of the terrorist attacks on his homeland, despite knowing that Osama bin Laden was responsible for those attacks, and despite the knowledge that … additional terrorist attacks and acts were planned,” Attorney General John Ashcroft said in 2002. The National Counterterrorism Center penned a document dated Jan. 24, 2017 claiming Walker Lindh remains as radicalized now as he was in 2001. “As of May 2016, John Walker Lindh (USPER) — who is scheduled to be released in May 2019 after being convicted of supporting the Taliban — continued to advocate for global jihad and to write and translate violent extremist texts,” the document said. The treasonous Walker Lindh is scared of the American government, and he has made plans to move to Ireland which gave him citizenship in 2013 based on his father’s ancestry. “Walker Lindh’s release has prompted security concerns, as he’s expressed wishes to travel to Ireland while also not denouncing radical Islamic ideology, including allegedly making pro-ISIS comments to journalists,” Fox News reports. The 38-year-old jihadi is blamed for the first American killed in the “War on Terror.” In the early days after 9/11, the United States was striking back at the Taliban in small ways which would prove to be huge in the coming days ahead. Tragically, Spann would be the first American soldier killed in Afghanistan during an uprising of prisoners at Qala-i-Jangi fortress after several Taliban fighters, including John Walker Lindh, rose up against their guards. Well, there’s another American soldier who is sending John Walker Lindh a message today. 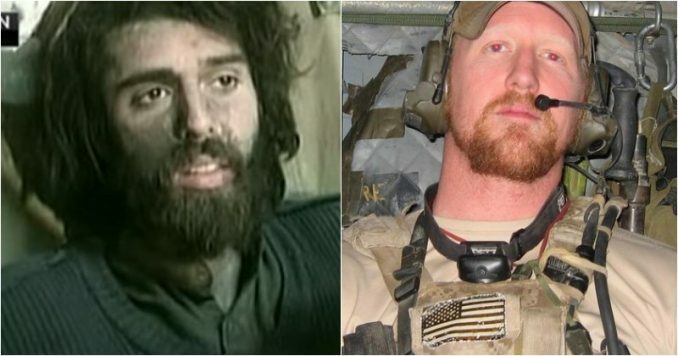 Rob O’Neill, the Navy Seal who delivered the fatal headshot that killed Osama bin Laden, isn’t too happy about the American Taliban fighter’s release. In fact, O’Neill gave him a big wake-up call via Twitter today. “They are going to release the terrorist John Walker Lindh in May. Some of us may need to come out of retirement,” posted the former Navy Seal. They are going to release the terrorist John Walker Lindh in May. Some of us may need to come out of retirement. There is no doubt John Walker Lindh has a huge target on his back. We have no idea why he is being released, but he might want to take out a big life insurance policy. There are a bunch of angry American soldiers who don’t take too kindly that he will be a free man after betraying his country and actively taking part in the death of at least one American. Good luck to the Irish. If he gets to the Emerald Isle, we bet he may have some issues with getting lodgings. Who in the Western world would want to have him as a neighbor? This isn’t justice. Let all Americans make their voices known. We do not want this disgusting traitor freed. He should spend the rest of his miserable life behind bars. America has deep wounds from 9/11, and countless young men have lost their lives fighting in the Middle East, so how can it be this man is free? Share this information so all your family and friends are aware there is a great injustice about to happen. With enough outrage, maybe we can stop it.